Pickler & Ben are coming back. Recently, it was announced the Nashville-based TV series has been renewed for a second season. Hosted by Kellie Pickler and Ben Aaron, the syndicated daytime talk show explores both lifestyle and entertainment topics. Previous guests have included Dolly Parton, Faith Hill, Tim McGraw, Little Big Town, Molly Sims, and Christian Siriano. CINCINNATI – The E.W. 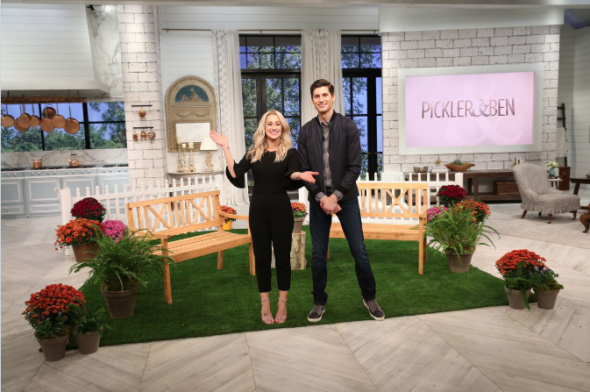 Scripps Company (NYSE: SSP) has greenlit a second season for “Pickler & Ben,” its Nashville-based daytime talker hosted by country music star Kellie Pickler and Emmy Award-winning television personality Ben Aaron. Recorded in front of a live studio audience, “Pickler & Ben” features the best in lifestyle and entertainment. In its first season, which debuted Sept. 18, 2017, “Pickler & Ben” has featured a roster of celebrity guests including Dolly Parton, Faith Hill, Tim McGraw, Little Big Town, Molly Sims, Christian Siriano, Cat Cora, Reba McEntire, Duff Goldman, Ty Pennington and more. The show draws its focus from the trends and interests of Main Street America and everyday Americans, with Kellie and Ben joined in segments by top celebrities, tastemakers and experts on everything from entertaining and home design to cooking and DIY and more. The show is recorded in Nashville on an expansive, modern farmhouse-styled set. “Pickler & Ben” is produced by Grammy Award-winning superstar Faith Hill; co-founder of Happy Street Entertainment, Lisa Erspamer; and president and CEO of Sandbox Entertainment Jason Owen; in partnership with Scripps. Award-winning director, Joe Terry (“The Oprah Winfrey Show”) directs “Pickler & Ben.” Disney/ABC Home Entertainment and Television Distribution is distributing the show in national syndication. Scripps also runs two other successful syndicated original programs, “The List,” which is entering its seventh season, and “Right This Minute,” which is entering its eighth season. What do you think? Have you see Pickler & Ben? Are you glad it’s been renewed? More about: CMT TV shows: canceled or renewed?, Pickler & Ben, Pickler & Ben: canceled or renewed? NOT available in GRand Rapids Michigan. Love this show! Every afternoon!! I think there are too many shows in the morning that deliver too much banter and not enough substance. I guess it’s because people are bustling around and basically using these shows as white noise. But, I for one, am hoping to find some real thought provoking content. The kind of gritty, meaty stuff that Oprah and Donahue used to deliver. I think that’s why channels like CNN are grabbing such big chunks of the viewing audience these days. I’m sorry, but WHY does Kelly have SO much makeup on?! She looks 3 times her age, and like a *clown*. I like Kelly just as she is, NOT all caked up… Just MY Opinion!